important for safety and quality. Calibration of pressure instruments in industrial environments requires the establishment of known pressure magnitudes. With a stable input pressure established, the pressure measurement instrument is provided with a referential benchmark that can be used to evaluate instrument output. 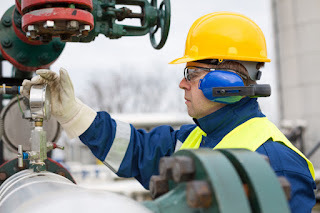 There are several physical test standards or methods that can be applied to pressure instruments. A deadweight tester, sometimes called a dead-test calibrator, creates accurately known pressure using precise masses and pistons of a known area. The gauge or pressure instrument is connected to the deadweight tester. The device is comprised of tubes that contain either oil or water, with a primary piston positioned above the liquid and a secondary piston across from the place where the gauge connects to the tester. A mass of a known quantity is placed atop the primary piston, which is perfectly vertical. The earth's gravitational field acts upon the mass atop the piston. The combination results in a known value being applied to the deadweight tester and subsequently allows for calibration of the gauge. Once pressure builds inside the deadweight tester, surpassing the weight of the piston, the piston will rise and float atop the oil. By rotating the mass atop the piston, the piston will rotate inside its cylinder and negate any impact from friction. Developments in technology have led to testers being equipped with hand pumps and bleed valves. 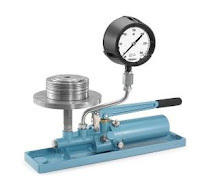 The same principles applied to a deadweight tester which uses oil are applied to a pneumatic deadweight tester, where gas pressure suspends the mass atop the cylinder instead of oil or water pressure. 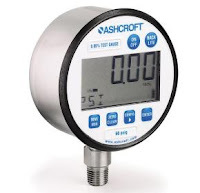 The manometer is another device which establishes a pressure standard to calibrate gauges. Alone, the manometer is simply a U shaped tube connecting a source of fluid pressure to the gauge being calibrated. Pressure applied to the gauge will be indicated by the corresponding heights of the fluid in the columns. If the value of the density of the liquid is a precise, known value, the aforementioned constant of the earth's gravitational field will combine with the applied pressure to permit calibration of the gauge. Test instruments which couple with the calibration of pressure transmitters are also instrumental in ensuring correct pressure calibration. Electronic and pneumatic test instruments, along with precise air pressure calibration pumps, enable calibrating a pressure transmitter in place, in the field, or on a lab bench. These portable devices, though, require their own calibration to physical standards with referenced properties. While different devices exist for establishing pressure standards in either high or low pressure environments, the shared standard allows for varying types of instrumentation to exhibit similar performance quality and accomplish the same task. Contact Swanson Flo for any pressure instrument repair or calibration requirement. Visit http://www.swansonflo.com or call 800-288-7926.